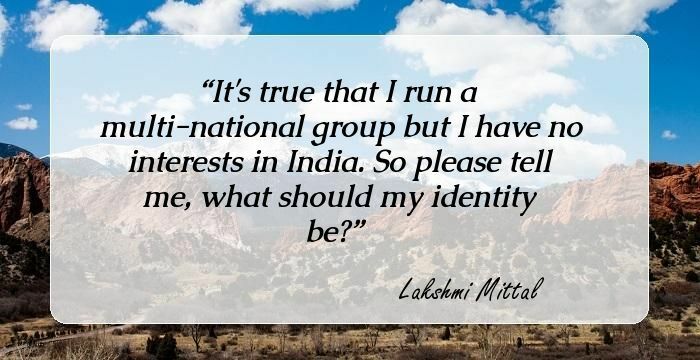 13 Motivational Quotes By Lakshmi Mittal The Man Who Is Known As The Doctor Of Sick Steel Companies Will Give Wings To Your Dreams. Lakshmi 'Arcelor' Mittal is the unrivalled king of the steel industry. Starting from modest family business he went on to create the world's largest steel manufacturing company. In here we list some interesting and lesser known facts about the baron of steel industry. After graduating from St. Xavier's in Kolkatta, Mittal joined the family owned steel company. He soon expanded the business to foreign shores thus Mittal International was established in Indonesia. From there he went to Trinidad and Tobago, followed by Mexico, Romania and Ukraine. Instead of building manufacturing units from scratch, Mittal began purchasing struggling mills and worked his magic to turn them into profit-making ventures. He then parted ways with his family and took charge of the foreign arm of the business. The Karmet Steel works acquisition was a major turning point in the history of Mittal Steel as it enabled the company to develop business relationship with China which was about to witness a boom in steel demand owing to the Beijing Olympics. In 2004 Mittal Steel became the largest manufacturer of steel with profits of over $22 billion. The company adheres to Corporate Social Responsibility and ensures the product from their units is sustainable and environment friendly. Mittal also is a well-known philanthropist. It's true that I run a multi-national group but I have no interests in India. So please tell me, what should my identity be? 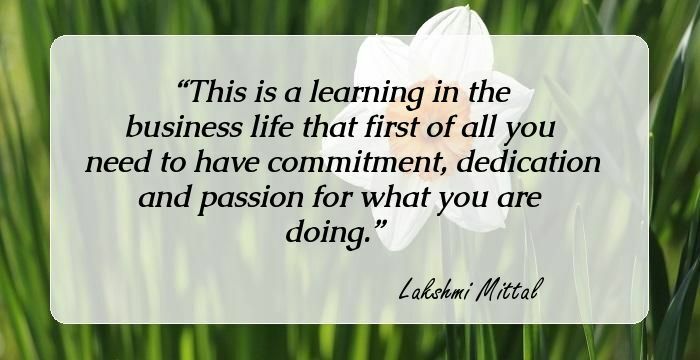 This is a learning in the business life that first of all you need to have commitment, dedication and passion for what you are doing. 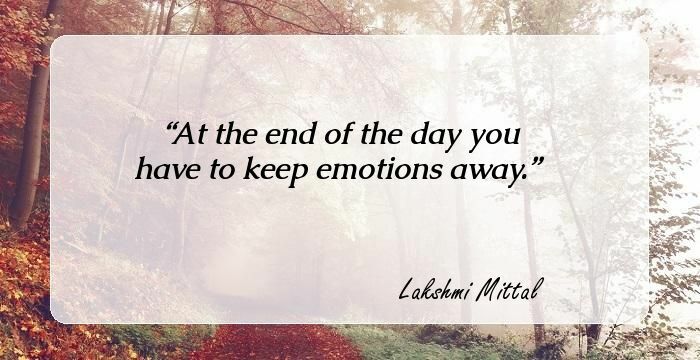 At the end of the day you have to keep emotions away. We are beginning to see the benefits of global consolidation. We are not in the business of iron ore. Whatever captive iron ore sources we have, we use it to make steel. It is true that we are interested in scale but there are very sound reasons for this. When people can see which direction the leaders are going in it becomes easier to motivate them. It’s difficult for them to do a deal at these levels. This is not about creating a giant. It’s about creating the sustainability of the steel industry. There will be no job cuts arising out of this merger in Europe — this is in the interest of jobs in Europe. I am sure all politicians will be convinced of the merits of this deal. If I go to a match it doesn’t mean I want to buy the stadium or the club. 10 Inspiratonal Quotes By Sabeer Bhatia, The Founder Of Hotmail, That Convey The Importance Of Perseverance. 23 Inspiring Quotes By Indra Nooyi The First Female CEO Of Pepsico That Will Help You Strike A Work-Life Balance. 20 Inspirational Quotes By Vinod Khosla, The Co-Founder Of Sun Microsystems, Which Will Dispel Your Fears Of Failure. Copyright © iloveindia All Rights Reserved.